People get married all the time, right? And everyone thinks theirs is the special one, right? The location. The decorations. The attendance. The credit card bill. More of it all means more special...right? How about just the fact there WAS a wedding? It’s certainly not uncommon, but when a medical family reaches this milestone, it is cause for extra celebration. Trenton and Jessica were engaged a year earlier at a restaurant overlooking the Dallas skyline in an area developed by legendary restaurateur Phil Romano. Now, we were celebrating with a rehearsal party at Phil Romano’s latest creation – Network Bar – a private bar with a dining room, lounge and private rooms, all of which were ours for the evening. We chose to have a party rather than a sit-down dinner for both families and friends to interact, and even Phil Romano was there. What’s so special about the connection to Phil Romano? Although Phil is best known for Romano’s Macaroni Grill, as well as Fuddrucker’s, Eatzi’s and others, one of his first successes was the heart stent. Phil was the early investor in the stent, of which Trenton had four prior to his last transplant. That made it all the more special when Phil toasted Trenton and Jessica. Can you imagine a more ideal day for Valerie and me? Can you imagine a more ideal wife for Trenton? The picture at the :44 mark in the following trailer is a photo of Jessica’s parents. Gary died three years ago from a ruptured aorta, so Daphne had married a guy who would one day leave her suddenly and unexpectedly. Was it worth the heartache, the “risk”? Look at the daughter who came from it and you have your answer. We don’t know when or how it will happen; it happens to everyone, and it’s not worth losing today worrying about tomorrow. The weather was hot on Sunday, June 24th, 2018, but the buildings were nicely air-conditioned. 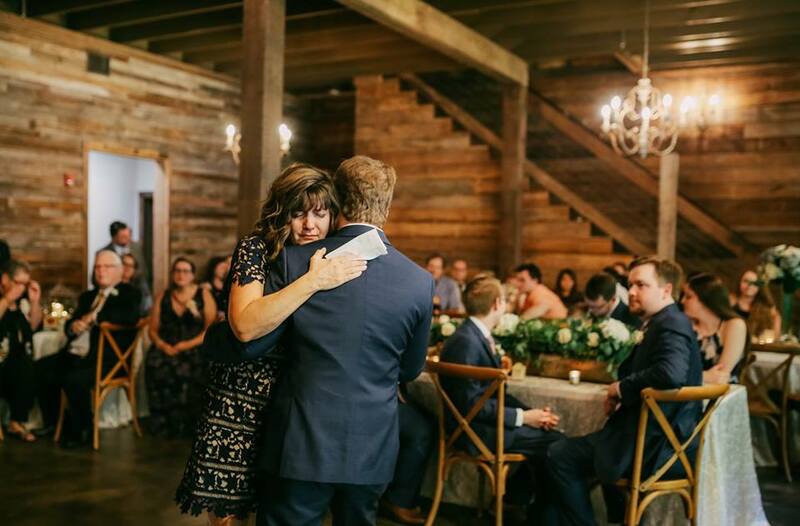 A country-style venue on the outskirts of Midlothian (where Jessica grew up) was the setting, with a quaint chapel and a barn-inspired reception area, along with a cabin for the wedding party to prepare, was all rustic elegance that was needed. Just like graduation from college, Trenton’s three mothers were present – Susan, our guardian angel at Children’s Medical Center; Dena, the highlight of our school years; and Valerie, the Trent-maker. Did you catch the mother/son dance in the video? That was one of the most significant moments at the reception and few were aware. Those few minutes were huge for Valerie, and medical moms will understand. The 8857 days since Trent’s birth all led to this. It’s more than you think, and it deserves its own blog post. Next time: the dance of a lifetime, and it’s for the medical moms. Thanks to A.E. Images for the photography and Petit Four Films for the wedding videography.